Every February the Redwood Unit’s finest gathers to put on the Packing Clinic at the Humboldt County Fairgrounds (Ferndale). Saturday is the actual Pack Clinic, which is open to the public with free admission. The Pack Clinic offers demonstrations on many backcountry skills, including balancing a load, tying knots, dutch oven cooking, highline set up, and much more. 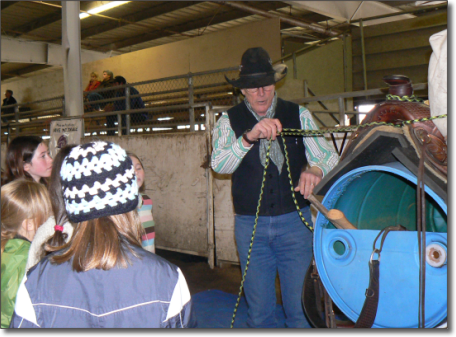 We usually have a horse trainer, trail challenge, BLM wild horse/burro adoption or other event along with the Pack Clinic. This varies by year. The raffle is on Saturday only. The snack bar is open all days of the pack clinic. Both the raffle and the snack bar are a fundraiser to help offset the costs of putting on the pack clinic. View pictures from past Clinics here! See the Newsletter for more information about the next Pack Clinic!